I have some time off for the 4th, and I decided to use that time museum and gallery going. The Kathryn Kelley post was one fruit of this. But really, most of what I saw didn’t affect me as strongly. Very little wowed me. These were shows not really worth a blog post each. It doesn’t mean they were bad, necessarily. The thing is, with a lot of them, I do have something that I want to communicate. Just nothing big. So I am going to use something they taught us in business school for communicating with possible future subliterate bosses and co-workers—bullet points. Mitch Debrowner at the John Cleary Gallery. This image from the announcement is by far the coolest photo in the show. Never a great sign. Kelli Scott Kelley at the Hooks-Epstein Galleries. I like the fact that her name is Kelli twice. It would be even better if her name was Kelli Kelly Kelley. Her art reminded me of the cover art from Fox Confessor Brings the Flood by Neko Case. Um, that was a really good album. 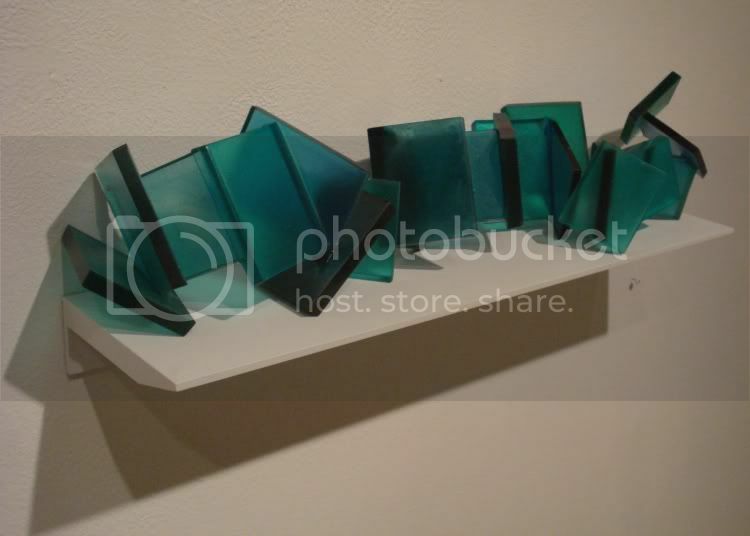 Michael De La Cerda at the McMurtrey Gallery. This guy’s art, made of epoxy resin, looks like candy. I want to eat it. McCartney wasn’t showing, but they had some of his pieces in back. They are made of hundreds of little plastic army men glued together and are really cool. A commenter tells me that each army man was individually tied together, not glued. I'm sure if I had gotten down and looked very closely at this piece, I would have noticed this. Sorry for the error, E.L. McCartney! North Looks South at the Museum of Fine Arts. It is really excellent that the MFAH is making a special effort to collect Latin American modern art. It’s a good specialty to have. That said, if I see another piece of freaking op art (especially kinetic op art), I will kill. Seriously, they should have displayed this art with “Miniskirt” and other songs by Esquivel playing in the background, cause that’s what this art was—decorations for space age bachelor pads. Carlos Cruz-Diez is the biggest offender. 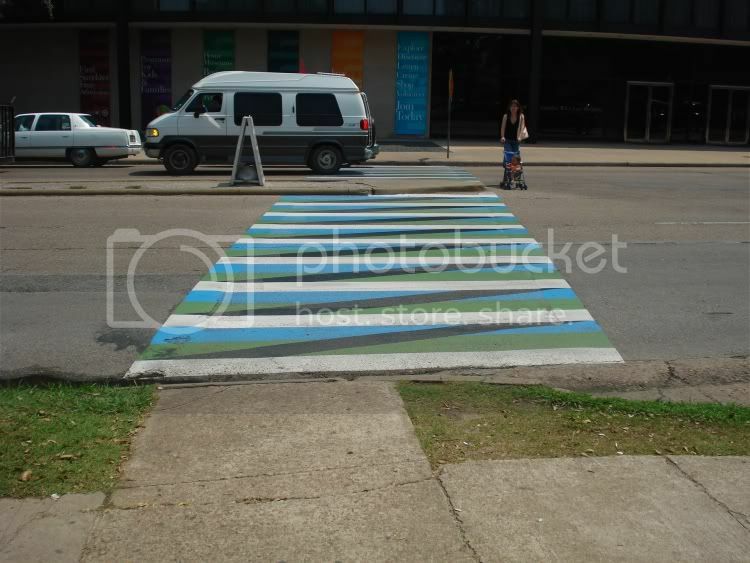 But in his favor, he did design the groovy crosswalks that are now in front of the museum. The city of Houston should license these designs from him and put them in place at every intersection in the city. Seriously. The pieces by Helio Oiticica and Lygia Clark are boring “neo-concrete” abstractions (ideal for hanging in Oscar Niemeyer buildings inhabited by robots—or military technocrats). The MFAH should get later work by these artists, which were sensuous and funky, and which prefigured the work of the arte povera artists as well as contemporary Brazilian artists like Ernesto Neto and Vik Muñiz. Contemporary Conversations: John Chamberlain, American Tableau at the Menil Museum. It must be really, really hard to move that sculpture. Do they ever have to re-weld it after a move? Jan van der Ploeg at Gallery Sonja Roesch. Very efficient art. You can get everything there is to get out of it in about 20 seconds. The Great Texas Sculpture Roundup at the ArtCar Museum. The Art Guys prove once again that a great idea trumps artistic skill every time. Their piece for the show consisted of anodized pails, plywood, and old shoes—and was the best thing in the show. Does this place really exist? I couldn’t find it. I think Google Maps steered me on a wild goose chase. Grr. I will try again. FYI, The "Wrecking Ball" by artist Edward Lane McCartney is not glued together. Each army man piece is hand tied to create the whole mass. The sister piece "Necklace of National Mourning" has been selected by The Museum of Art and Design in New York "MAD" for the permanent collection. The piece is currently on view at Goldesberry Gallery in Houston until it is shipped. Thanks for the info! I'll say it again--they were all really cool pieces!